The fabrics have been so popular that I've now increased the range and added them to the customer selection of the website. 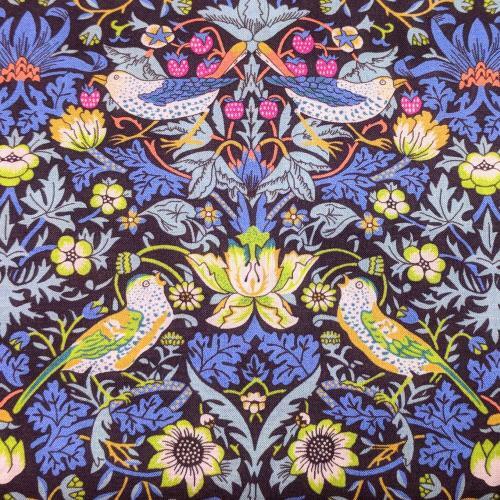 A select range of stunning prints for the house of Liberty of London. Some based upon the timelessly elegant work of William Morris. And a small range from select group of the World's leading designers. Including local designer Jen Kingwell. Just add the desired fabric to your cart and your item will be lined with your selection. Good Luck choosing - they're all so lovely! Very excited about this latest product. 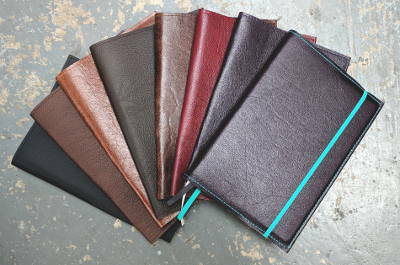 I've created a special reinforced pocket in the back with cutouts that allows full access to the elastic closing strap of these beautiful German made notebooks. 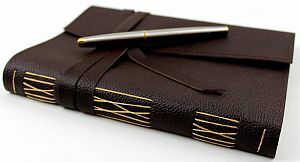 Popular since 1917, they are also the maker of the The Official Bullet Journal which is same size as the classic 1917, so this cover fits both. 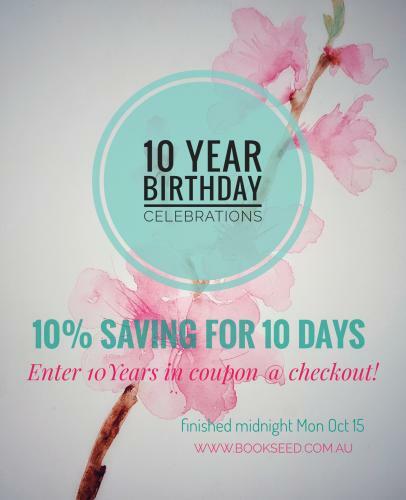 I'm very proud to announce that Bookseed is celebrating 10 years in business! And I'd like to share my gratitude with you, my lovely customers. So I'm having a 10% sale for 10 days to celebrate the 10 Years. Just enter '10Years' into the Coupon area at the checkout. Finishes midnight October October 15. Thank you to all who have supported my work over the years and offered kind words of encouragement! After Pay payment services are now available online and in store. I have great pleasure in welcoming a new paper to my studio. The beautiful Knight paper that is made in Italy. It will now be used in all my journals and is available in 90 and 120gsm weights. I've been trialling this paper over the last few weeks and it's superb. With the closing of the Shoalhaven paper mill in Australia my regular watermarked paper is now being made overseas and the quality and is no longer up to the standard that I set for my range. 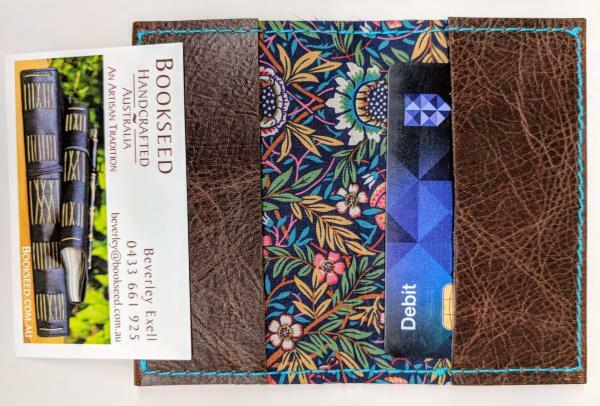 This is the first change in paper in 10 years for Bookseed. There will be a slight changeover period as I ammend the wording of the products in the online store but please assume that all new orders will carry the Italian paper going forward. And it takes inks and fountain pens beautifully! 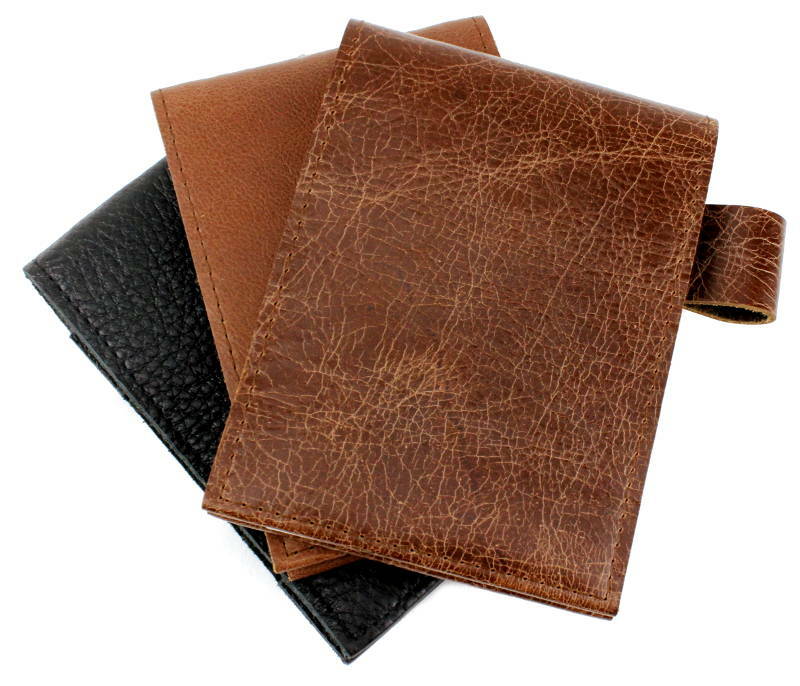 Beautiful Leather Desk Mats are now a part of my regular range. 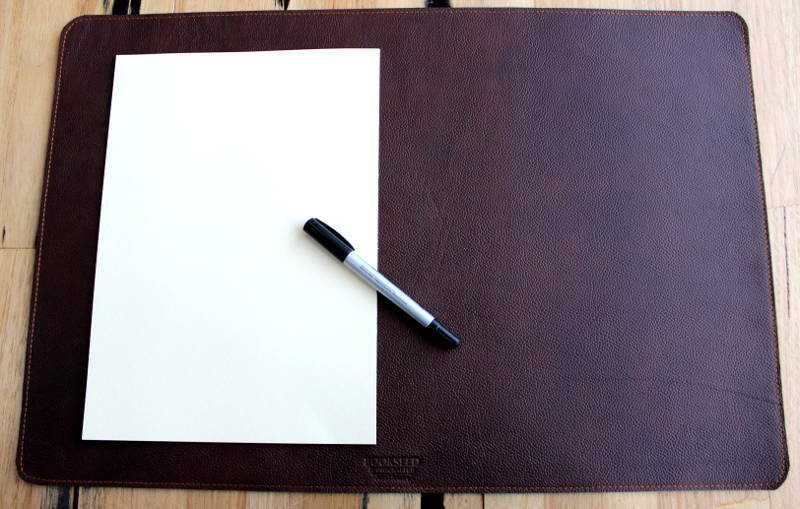 Backed with soft cork that is lined with felt, these desk mats provide a lovely cushioned surface for writing. And a warm soft feel to a sometimes cold desk. Can also be used to hold a keyboard or laptop with the side then creating an ideal mouse mat surface. Available in the full range of my leathers. Create a uniquely personalised gift by debossing initials or a short name into the desk mat. And for Fathers Day I'm including the debossing on the Desk Mats as my gift! 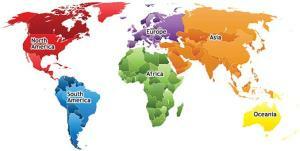 International orders can now be processed online. I've linked in with Australia Post which provides the facility for International postage to be calculated at checkout via the shopping cart. Customers can also choose a variety of postage options. It seems to be working well and is now much easier for my overseas customers to purchase. Welcome to the World of internet shopping! I'm very excited to announce the release of my new range which I've titled - THE DESIGNER COLLECTION! I've been playing with beautiful fabrics and threads and combining with my favourite leathers to give magic to my favourite pieces. Including those talented artists from Liberty of London. And I've chosen prints from leading designers such as Kaffe Fassett, Tula Pink, Kathy Doughty and Sarah Watts. I'm delighted with the results. And now I'm offering the chance for you to do some designing too! I'm offering these beautiful fabrics on some of my most popular items and allowing you to choose the leather colour and fabric combinations...Enjoy! And if you need a hand, please just give me a ring or send me an email. Happy to advise. I have now added to the wide strap range with the beautifully rich espresso brown leather. Cue the music, flash the lights, eyes on the catwalk.... and here she comes.... this year's Purple Leather is deep, deep, violet and soft and luscious! 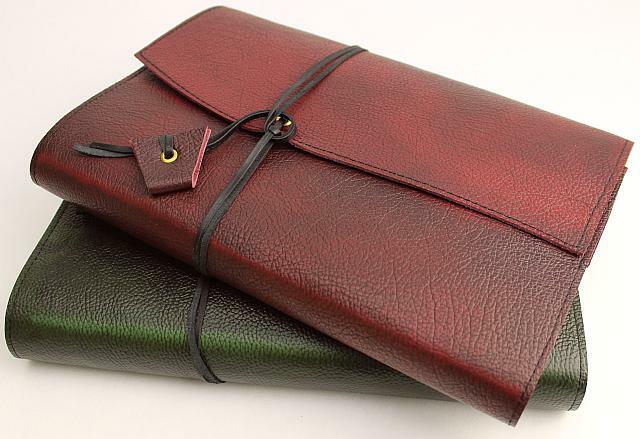 I'm delighted with the latest addition to my regular leather range. It's very, very soft and feels beautiful. 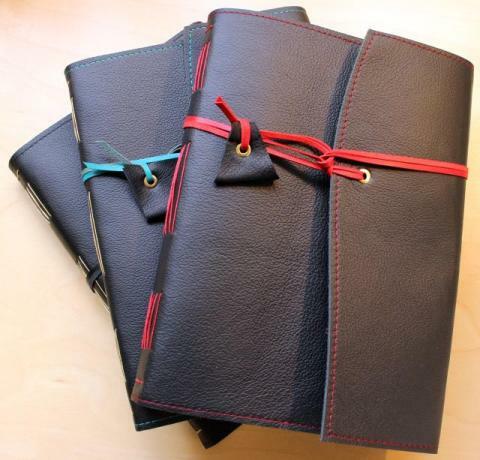 Currently available in A5 journals in three colour combinations: Purple and Red - Purple and Turquoise and Violet Purple ! 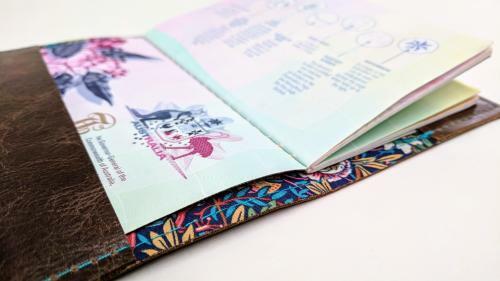 I will be adding more items to the range such as: Notebook covers and Bookwrap and A4 journal so please email or phone if you would like to order prior to them being available online. 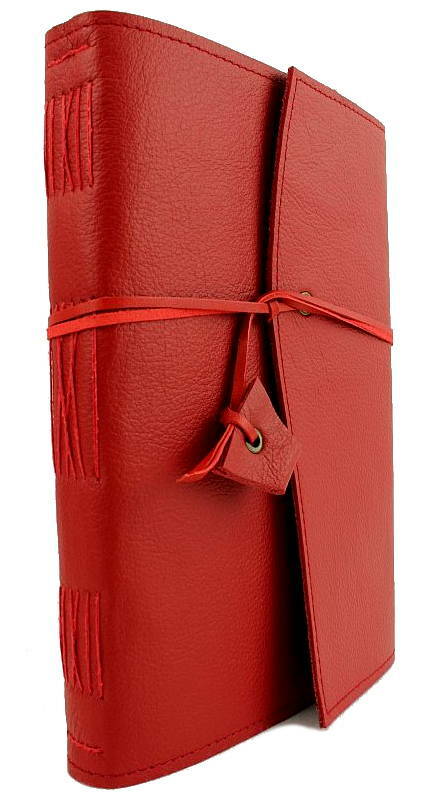 The popular Aussie Travel Journal is now available in the rich ravishing red leather. 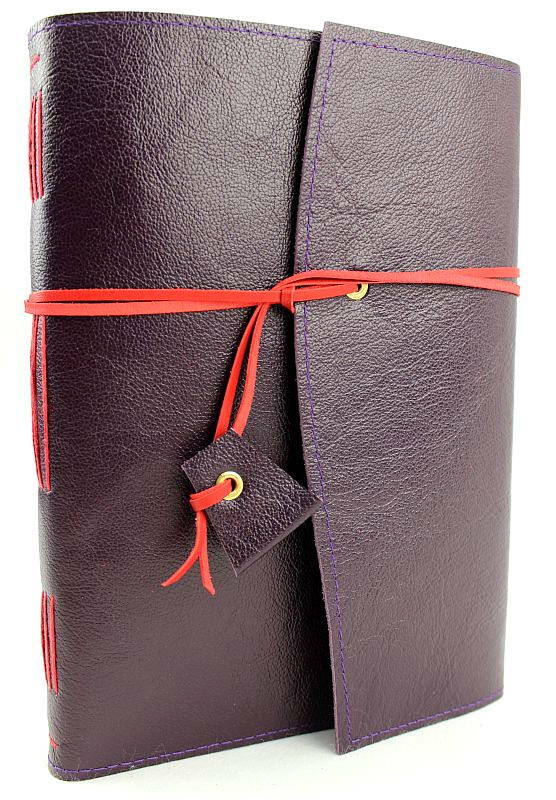 This red leather is a perfect traveller - soft and supple but very hardy - ideal backpacker! 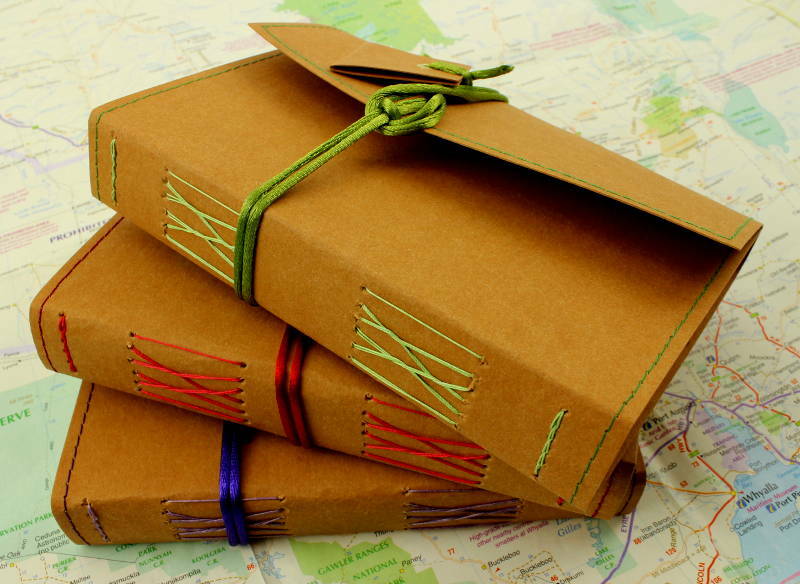 Very excited to announce the release of journals made from NON leather Kraft Paper Fabric. Ideal for Animal Lovers and those who would prefer not to use Animal products. It's also Vegan Friendly. 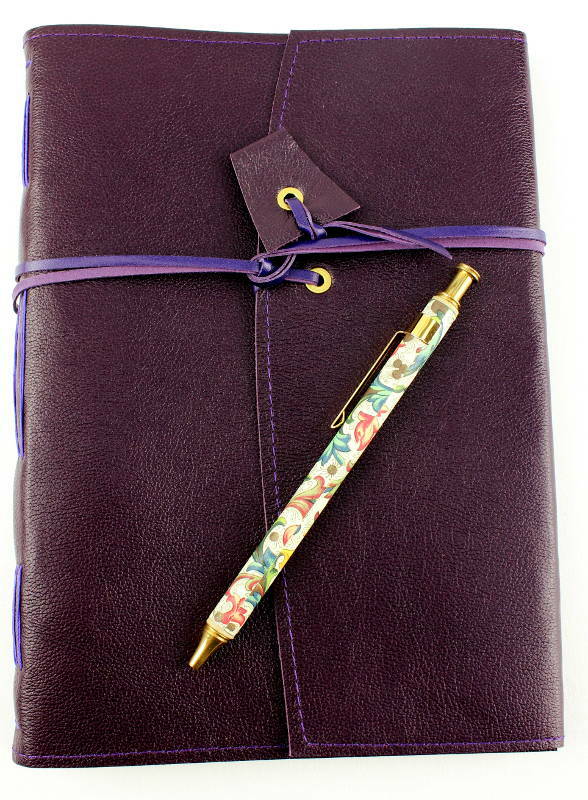 And another bonus is that you can draw, paint, sketch, write messages on the outside of the journal. 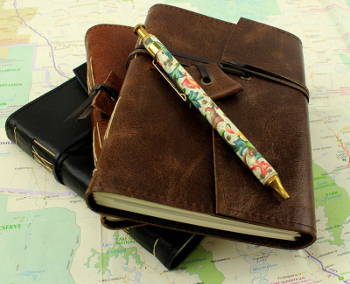 Great way to personalise for yourself, or write messages for a loved one travelling. Like my other travel journals these now also feature the centre Story Board that is made from the beautiful Italian Drawing Paper. I will be adding more items to the range as soon as I can but if you would like something from my regular range made with this new Paper Fabric then please just let me know. 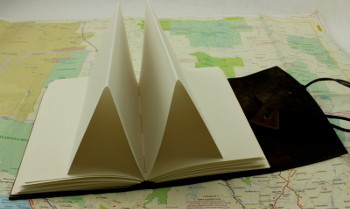 Beautiful Italian Drawing Paper concertina centre... ideal for drawing, mapping, sketching or dreaming! The Story Board Centre in beautiful heavyweight paper hides secretly in the centre ready to expand and reveal. The new pocket size travel journal (A6) is ideal for tucking into small spaces and taking with you when you're on the go. Will still hold a phone if it's not too large and is available in a range of colours. 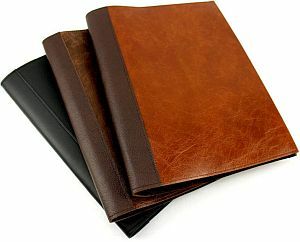 Personalise with a title page or monogram the leather cover for a unique gift for a loved one. Love the feel of these and how quickly they transform the everyday plastic display pocket folder into something beautiful. Available in a range of leathers, or contact me for your preferences. For lovers of fine stationery! 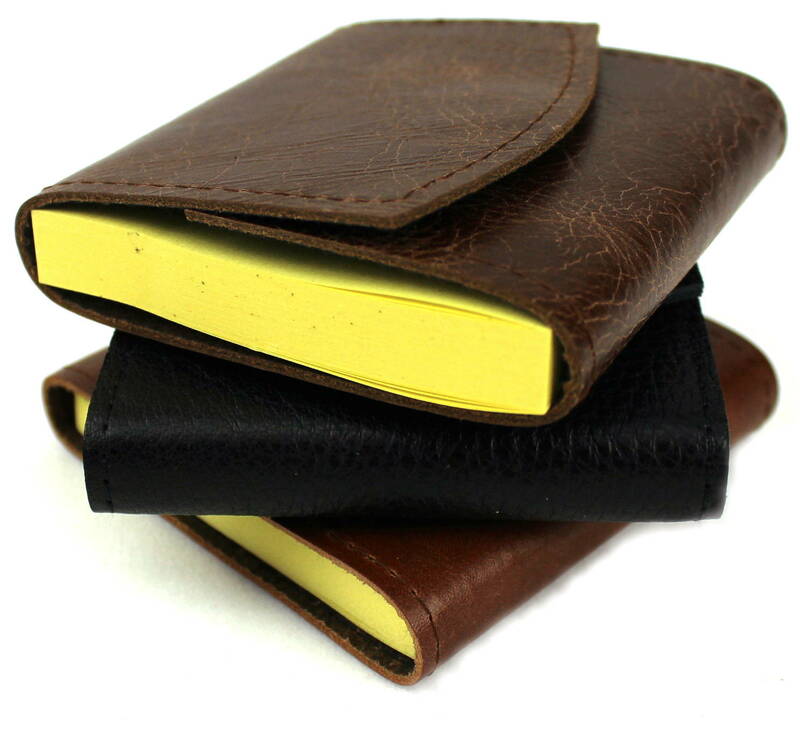 The popular Sticky Note covers are back in stock. And a new addition with the 'Detective Style' Notepad cover. And I've created a Duo Stationery Set for savings on a monogrammed impression! 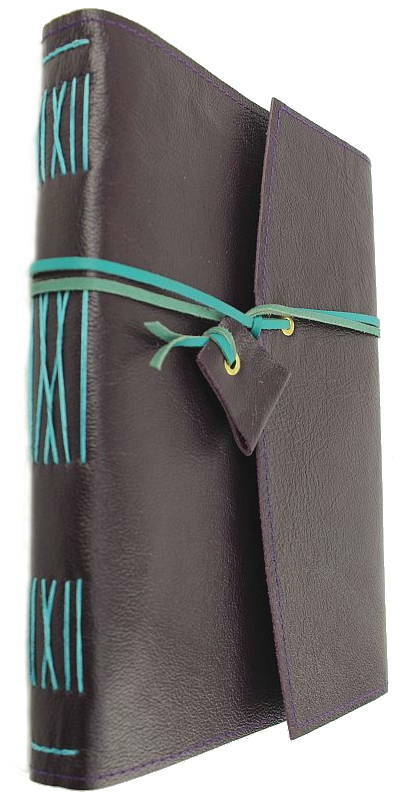 Capture those Pearls of Wit or Wisdom in a handcrafted leather journal. Ideal for Fathers Day. Available in both A4 & A5 sizes. The return of an old favourite. 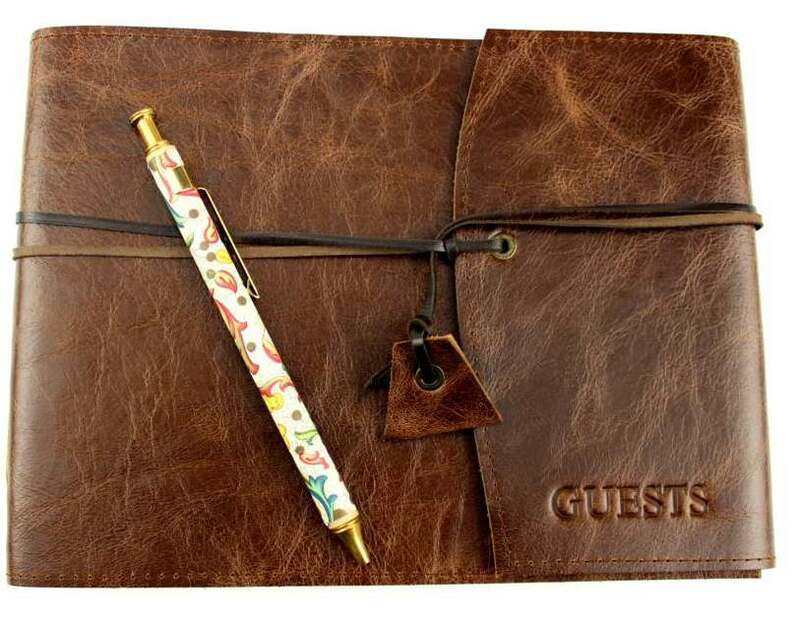 The Guest book is back in both Landscape A5 and Portrait A4 sizes. Available in the full range of colours - (I'm still photographing the range so just ask for your colour in the meantime). I've been busy in the studio trying to build up my stock of classic favourites. 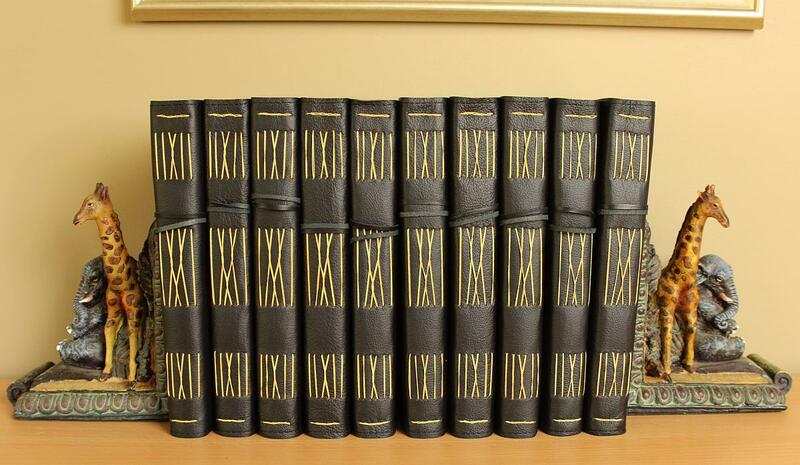 I hand dye the Antique gold french cotton which creates that timeless elegance when stitched into black leather. When my leather supplier showed me his beautiful range of leathers used to make the classic Chesterfield furniture, I just knew that I had to include it in my range. I have both the Emerald Green and Ruby Red colours. Richly dark with a hint of the undercolour peeking through in the well worn areas of the pieces. I've been learning about the 'rubbing back' technique to reveal the hidden colours, which also gives an old look and feel to the piece. Or the type of much loved look that well used treasures obtain - the patina. 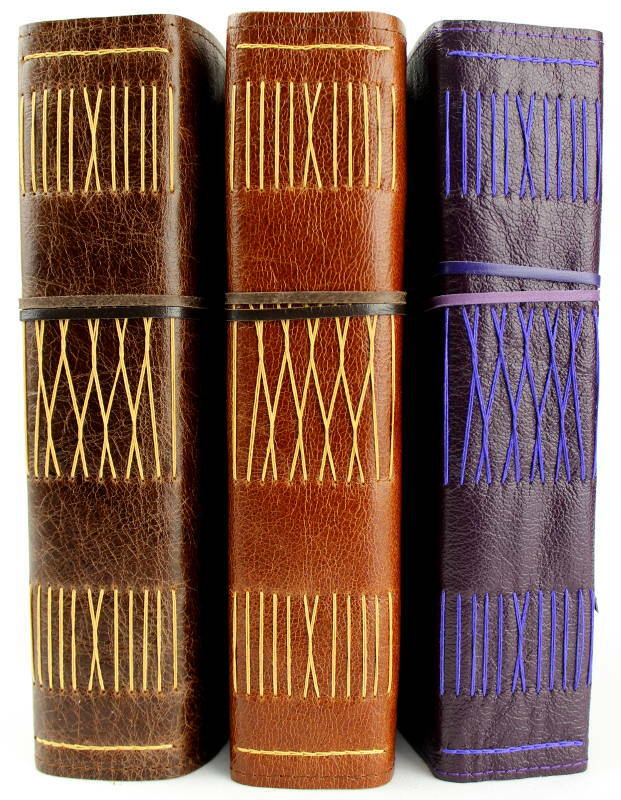 These leathers are available in all of my range: Journals, Book Wraps and Notebooks. I'm still trying to build up the stock to photograph but can certainly make on request. So feel free to email me if you would like something made from these lovely leathers. Many thanks to my young and enthusiastic filmmakers - Alex, Giulia and Valmorey who filmed this short video in the studio last week. 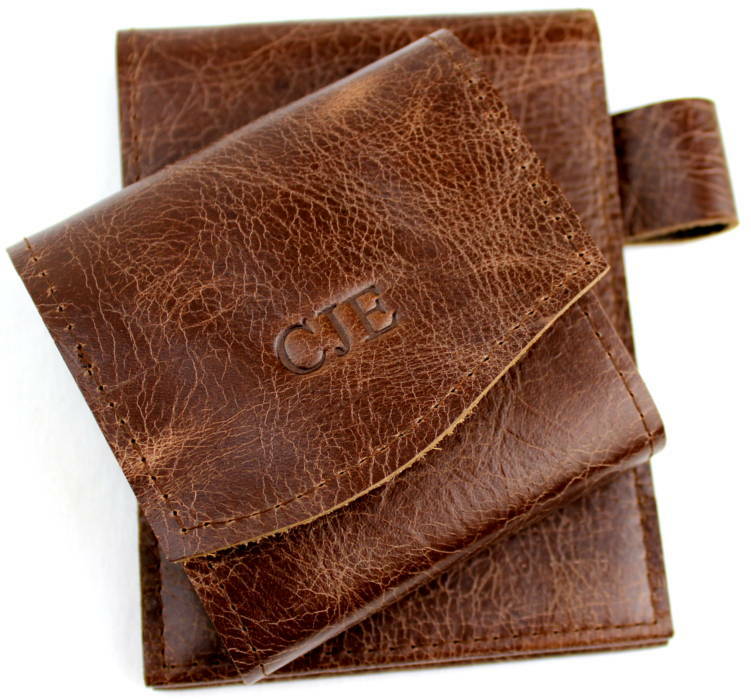 I am delighted to announce that I can now offer monogramming of initials on most of my leather items! Many of you have been asking and waiting patiently and I've now finally got the equipment in the studio. 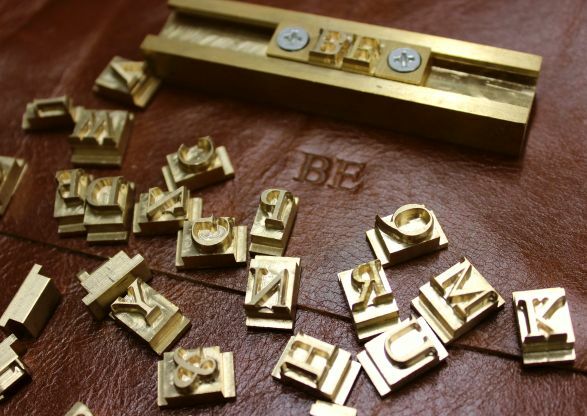 Currently offering the beautiful 'blind debossing' - where the gorgeous brass letters are heat pressed into the leather. Creating a beautiful subtle, elegant and timeless result.